Whether you are new to a leadership position, or been around the ring many times, (and have the battle scars to prove it! ), having the situational leadership model in your tool bag of skills will be useful. It would be wonderful if we could treat each person in the team exactly the same ... using the leadership style that you feel most comfortable with. Unfortunately, as you've probably experienced, one glove doesn't fit all hands. As you have probably experienced, these two factors can vary from situation to situation with each employee - for example you might have someone who is an absolute gem at making sales calls: highly competent and highly committed to it ... but getting them to submit their paperwork - well that's a different story. So, a key point here is that you may need to use one or more styles of leadership with an individual on an given day. This person may be new to the team/organization and is excited about their new role. At the same time, s/he doesn't yet know the ropes, so doesn't have the skills required for the job in hand. This person may have been around for a while and may have some relevant skills. Motivation and enthusiasm have dropped. The person may be thinking of leaving. Inconsistent in their performance and unsure of the difference they make. This person has probably been around for a while and is quite experienced and capable. At times though, lacks the confidence to do things alone and/or the motivation to do it well. Might be bored and looking for new challenges. This person enjoys what they are doing, is highly competent and probably even teaching others the ropes. The model combines these two key factors into four styles of leadership you can use. 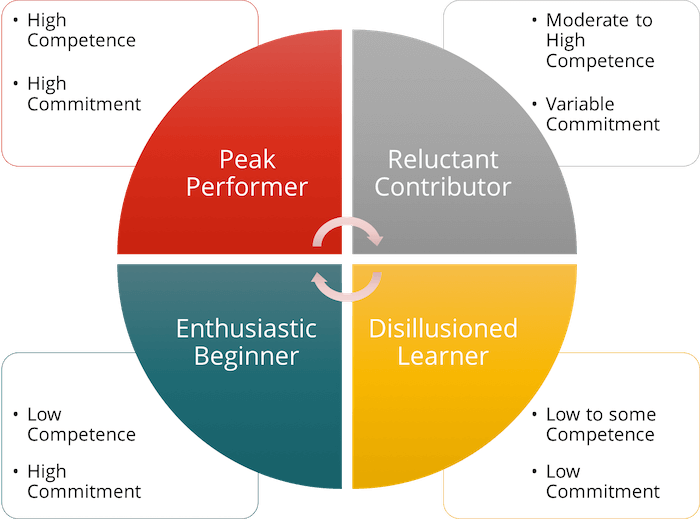 This quadrant is useful for people who are keen but lack competence (D1). There is a more focus given to helping the person feel they are achieving, by getting the task done, and less on building the relationship - (the assumption is that the relationship is still in the 100 day honeymoon period!). The leader is very task focused. Showing and Telling the person what to do, how to do it and when they need to be finished by. The leader provides as many explanations as are needed, but there is no discussion/debate on what must be done. Problem-solving and decision-making are initiated by the leader. The team member needs this type of direction to get them started. Directing = "I want you to do x, y and z, in this way ..... , by 4 pm"
Sometimes, you may toss in a little 'selling', especially if the person is moving toward one of the other quadrants and you want to help them to improve their competence levels. The leader should be closely monitoring the team member's performance, making sure they are on the right track. 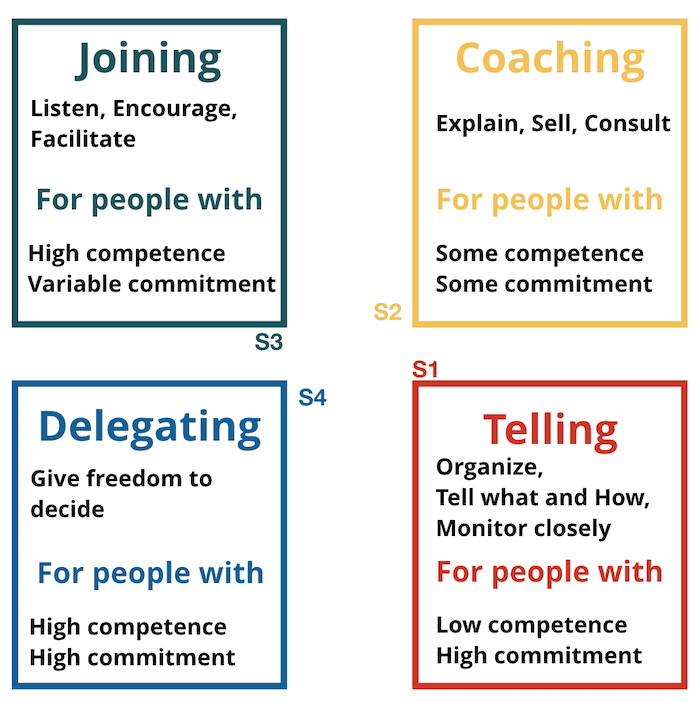 This quadrant is used who for team members who have some competence but lack commitment/motivation (D2). In this quadrant the leader still gives a high degree of direction and is still the centre of the universe for the team, and the individual. They lead with their own ideas, however they are also explaining why things need to be done the way requested and seeking much more input from the team members. In order to build commitment and self-esteem, the leader considers more fully the feelings, ideas, and suggestions of team members. Two-way communication and support is increased, but control over decision-making remains with the leader. The leader must be up front - we'll discuss, but ultimately I'll decide. Do not pretend that you are going to utilize their input, if you have already decided what/how the task is going to be done. That will only land you in hot water. Selling = "I am faced with this challenging situation, what I'd like you to do is x, y and z, the reasons I want you to do it are ..."
Testing = "We are challenged with this situation .... I have given it some thought and think we can overcome it by taking any of these three paths .... Before I make the final decision I'd like you to provide me with your thoughts, and any other information I may have missed." Consulting = "We are challenged with this situation ... Please come up with some ideas on how we could resolve it and I'll make the decision which of the ideas we should implement." "While I make the decision in Q1 and Q2, I'll do all I can to help you understand the reasons for my choice. I'll spend time explaining to you why I believe my decision is the best course of action, but ultimately I decide what we do. Hopefully, in most cases, you will agree with the direction we are taking, as strongly as if you had made the decision yourself." Used with team members who are competent but may at times lack motivation or confidence (D3). They don't need much direction on how to do the task, but need support and encouragement to bolster confidence and motivation. The focus of day-to-day decision-making and problem solving shifts from the leader to the team member. The leader is operating more as a resource and facilitator. Joining = "We face this challenging situation ... let's come up with a solution together about what we need to do." Used with the team member who is highly competent and highly committed (D4). Virtually all of the tasks are handled with little input from the leader. The team member directs his or her own behavior, and decides how tasks should be accomplished and how often to involve the leader. The team member is willing - even wants - to work by him or herself, with little support or supervision. The leader is focused on strategic issues and works with the team to rapidly implement changes that enable the team to remain competitive in the marketplace. Delegating = "We have this problem ... Here's the framework within which we have authority to act. Decide the best course of action, and I'll keep out of your way." Be deliberate in choosing the appropriate style of leadership by asking yourself 'What does this person need from in terms of direction?" Go to the resources section to download your copy of this worksheet. Why would you want to decrease the amount of direction that you are giving someone? What will you need to do to be able to apply this knowledge? Who do you know that is particularly good at flexing their style to suit the competence and motivation levels of others? What specifically would you like to role model about the way s/he performs?